ePublishing Knowledge BaseePublishing Knowledge BaseePublishing Knowledge Base AdvancedHow do I update CSS styles on my website? If you have high in-house technical skills, access two files to have a dramatic impact on your website without additional development from ePublishing. One is the CSS (Cascading Style Sheets), which is hosted in the Media Manager. Look for a file called yourdomainname.css. This article covers how to update the first of the two: CSS. Only advanced users should update the CSS on their websites. If you have questions, please contact your ePublishing solutions manager. 1. 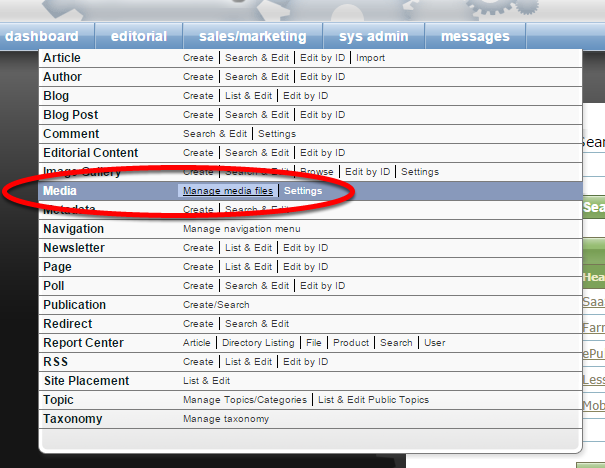 Access your Media Manager under Editorial. 2. 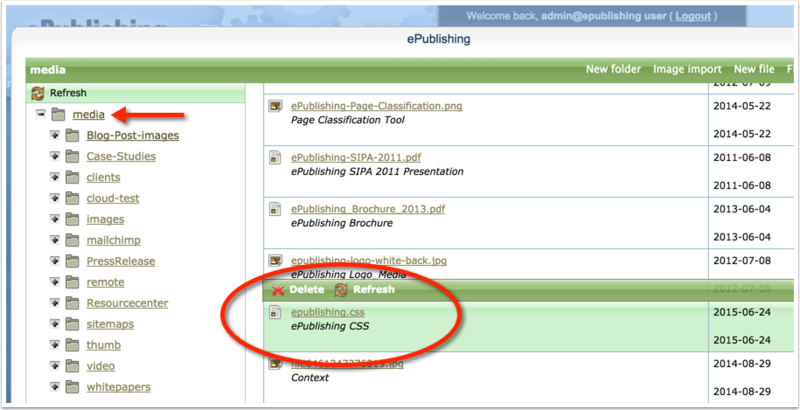 In the top-level Media folder, click on yourdomainname.css. Advanced users only please. Replace "yourdomainname" with your domain name. Do NOT change the file name. Note: If you make a change to this file that results in needing to submit a support ticket to ePublishing, the time spent researching and fixing the problem will be considered billable. We recommend testing any changes on your staging site. 2.1. If you don't see the file, add it. Zoom: If you don't see the file, add it. The templates only use this file if it exists in the Media Manager. 3. Add any CSS references you want to use on your website. This CSS file will be the last loaded on every page, so it will overwrite any existing website styles. In order to make sure any styles you add do not collide with existing site styles, or future updates, we have a few guidelines. Do not style content outside of WYSIWYG content. Caution: Only use these files to make enhancements to Editorial Content Zones, or other WYSIWYG editor controlled content. Styles directly affecting your core template can collide with our core code, these changes should be submitted as change requests. Our core code is always improving, we cannot gaurantee any conflicting code managed by you would not be negatively affected; fixing such code would be considered billable. Prev: How do I send webmaster emails to multiple recipients?